[caption id="attachment_170" align="alignleft" width="300" caption="MI-24 Military Helicopter"] [/caption] I was browsing through websites when I came across a video that showcased a gigantic RC helicopter built to utmost perfection. Being a collector myself, I couldn’t help but feel certain envy over what I saw on that video. Without doubt, that particular RC helicopter is definitely the largest I have ever seen in this lifetime. 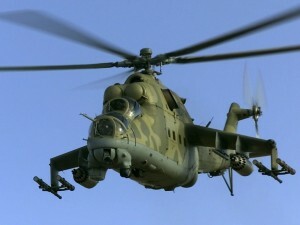 After watching the video and doing my research about that enormous beauty, I learned that it was modeled after the Mil Mi-24 Gunship helicopter. GizmoWatch later confirmed that it is the largest RC helicopter ever built by the human hands. It was mentioned in some of the links relevant to that video that the RC helicopter has a length of 7 feet. Though I was not able to find the exact dimensions of the RC model, what I found was the measurements of the real life model. It was recorded that the genuine Mil Mi-24 Gunship helicopter measures 56 feet 9 inches by 70 feet 5 inches by 21feet 4 inches. The cockpit is fully armored with a bullet proof front glass for protection. It also boasts a maximum range of 99 miles and a maximum speed of 208 miles per hour. The real helicopter was operated by the Soviet Air Force and manufactured by the Mil Moscow Helicopter Plant. It takes two pilots to man the aircraft that can carry 14 stretchers or 8 troops. No specs were available for the RC helicopter but the video is more than enough proof that it can fly flawlessly with the help of an experienced pilot. And as an estimate, the RC version is scaled 1/8 to its real life counterpart. For both experienced and novice RC collectors and hobbyist, the scale model can cause awe or can be a source of envy to some. Flying RC helicopters can be challenging for beginners but a little practice is more than enough to get the hang of it. And if you have enough in your budget to buy bigger models, you will find controlling the flight a whole lot easier compared to the smaller ones. Because larger models present a steadier and more balanced flight, it won’t be much of a wonder why the large monstrosity that we have talked about earlier flies so gracefully despite its weight. But for a novice who is still learning the basics of flying RC helicopters, using a smaller model can prove to be more practical because successive crash landings may damage some parts. And with smaller parts to replace, you will spend less money on repairs. A lot of people have already joined the trend of taking up RC helicopters as a hobby. It may call for a considerable amount of cash to be invested but the satisfaction one can get is priceless. Some may just simply buy ready to fly models but there are also those who prefer to fly something that they have built themselves. They take pride in the fact that the thing flying in the air is their own creation and that they have made everything work together, from body to machine to electronics.